The Fall Farm Tour is one of our best events each year. Millstone Institute for Preservation is once again organizing, with help from Bobbie. Guidebooks for all the Farms and Ranches will be ready soon and can be picked up at a variety of locations in Monticello. You can download a PDF, too. We’re waiting to hear back from Katie the Big Cow’s owner to see if she can come on the 27th. Check back soon! We are delighted to have Katie the Big Cow with us this year. Brought to us by Southeast Milk, she will be here on Saturday only. Come learn about dairy cows and the dairy industry. The kids love this giant cow. Southeast Milk brings plenty of dairy-related handouts like coloring books, hats and cow pattern cups! They are a full-service cooperative operating for the benefit of its 147 milk-producer members, 35 of which produce Organic Milk. The majority of its members are located in Florida and Georgia. The size of the member herds range from under 100 to several thousand cows. 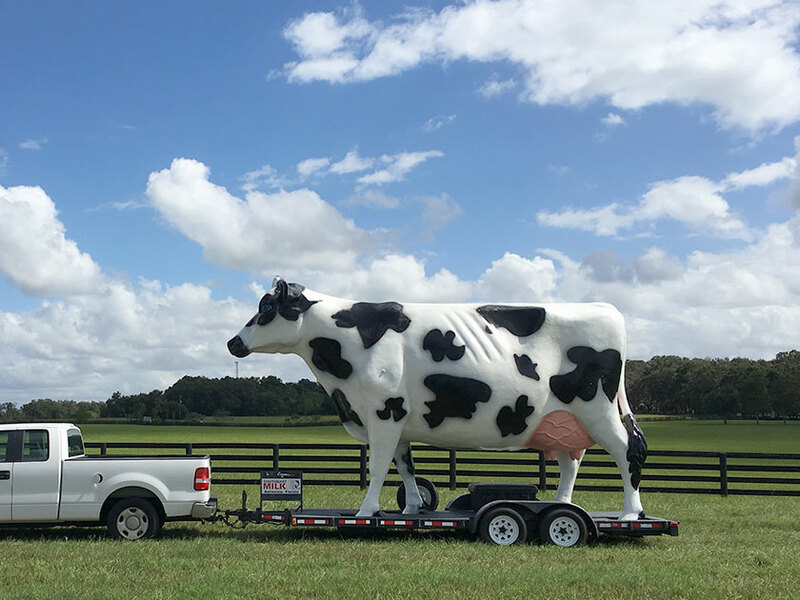 Southeast Milk currently handles the processing, transportation and marketing for most of the milk produced in the state of Florida. 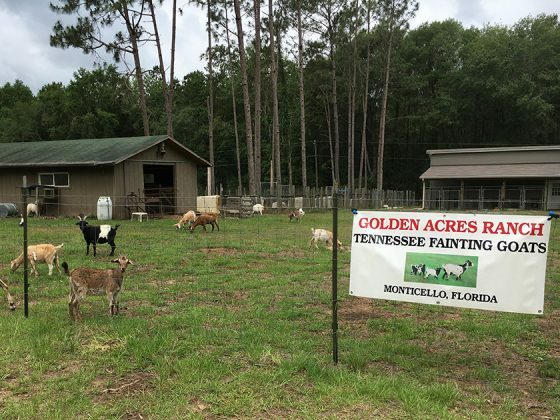 Hear the newest stories about what is going on at the ranch, and stop at all the different fields to see sheep, goats, dogs and the Mayhaw pond. Bring the whole family for a country ride on the wagon. It is always fun! 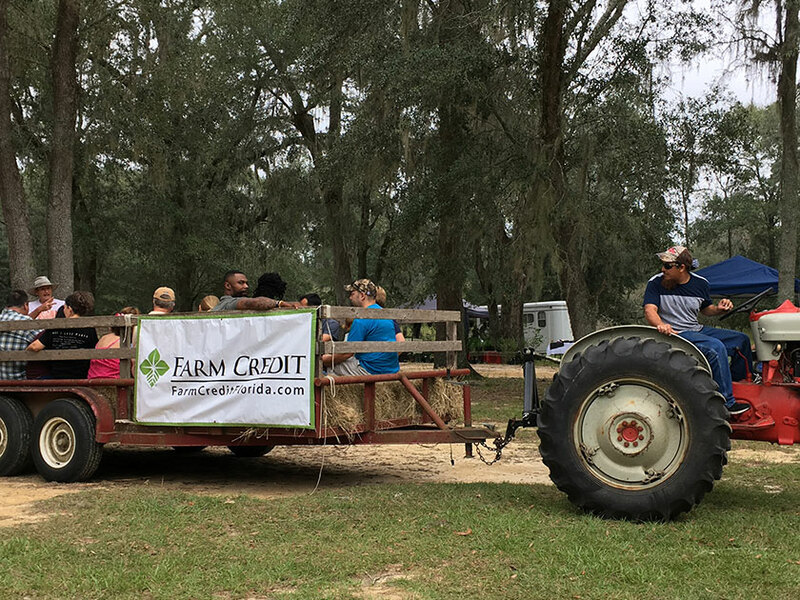 The hayrides are sponsored by our local Farm Credit of Florida. We have some very tame goats that even young children can pet and feed. We set up a table where you can buy cups of feed and get instructions on how to feed livestock animals by hand. 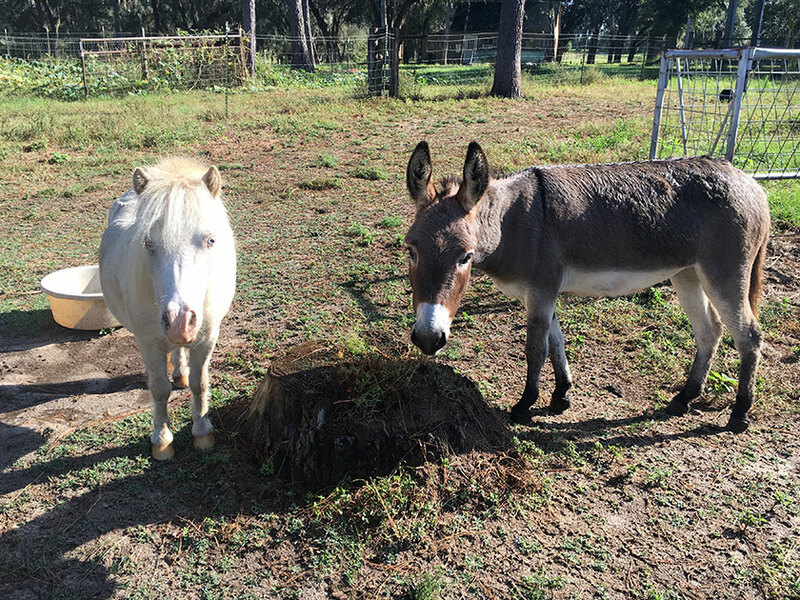 Tyrion is the white, mini-horse and the mini-donkey is Cookie. We bring them both out for folks to pet, groom and feed. They love the attention! 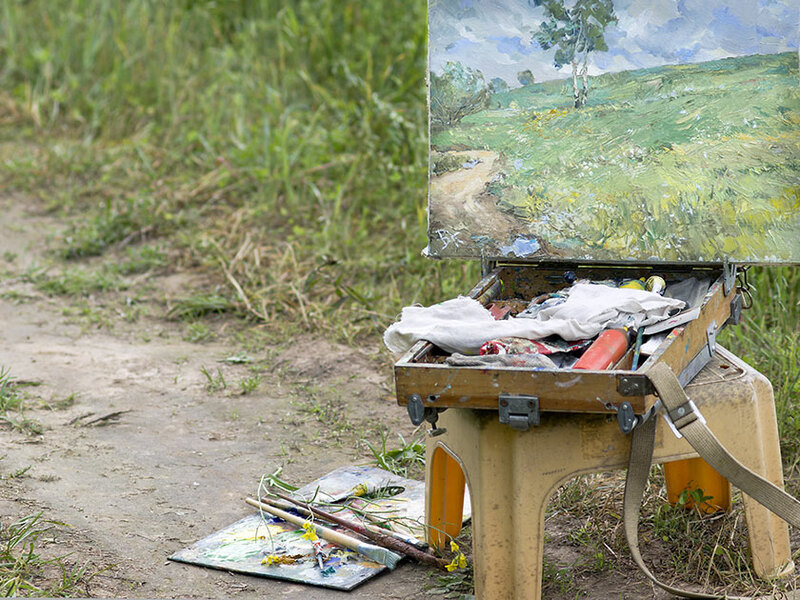 The Jefferson Arts Gallery is getting together a group to paint “en plein air,” which is the French expression for “in the open air.” Plein air painting is about leaving the four walls of your studio behind and experiencing painting and drawing in the landscape. Come watch the painters work and pick up some tips if you are interested in painting. 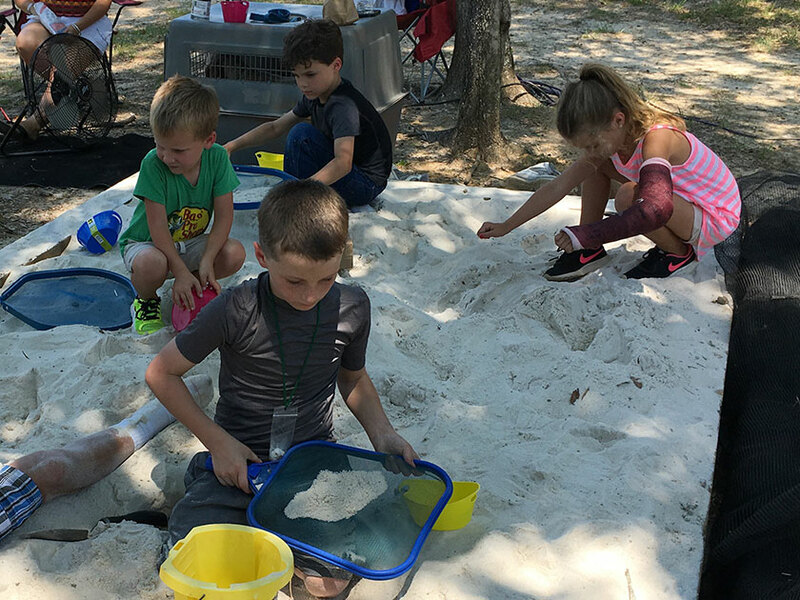 The Archeological Dig was a big hit at our last Mayhaw Festival. Kids are given a scoop and screen to filter sand from our big sandbox. They can unearth real animal bones, ‘dinosaur eggs’ and other surprises. 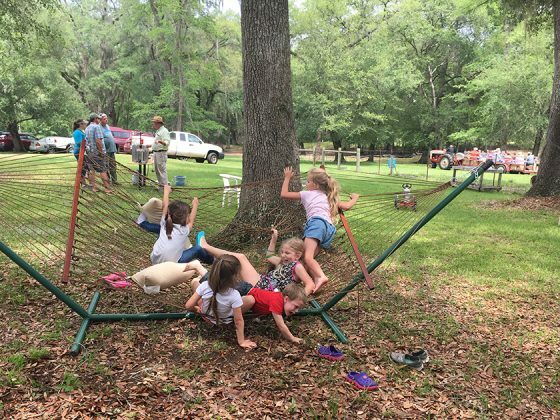 At the last festival, a bunch of kids discovered the hammock to climb on. 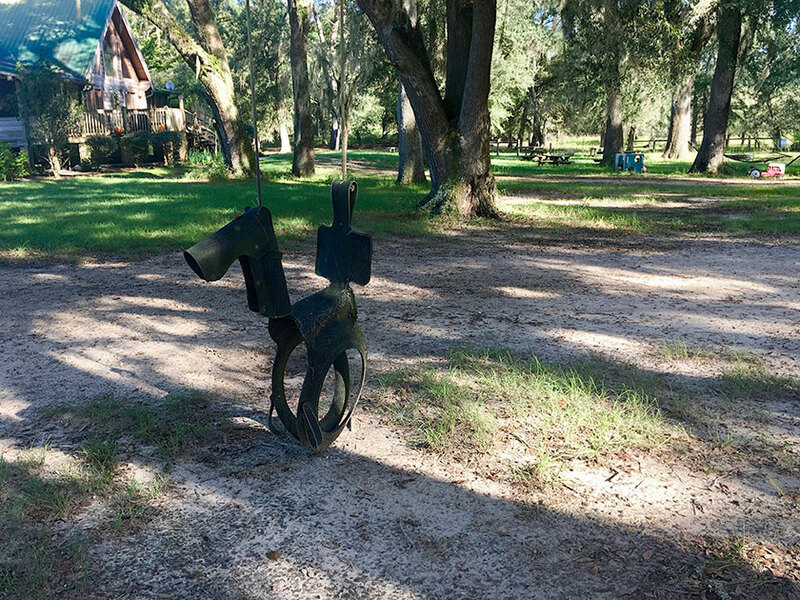 No kid can resist the phony pony swing here at Golden Acres Ranch. Farm Credit also brings Corn Hole Game equipment for everyone to use. 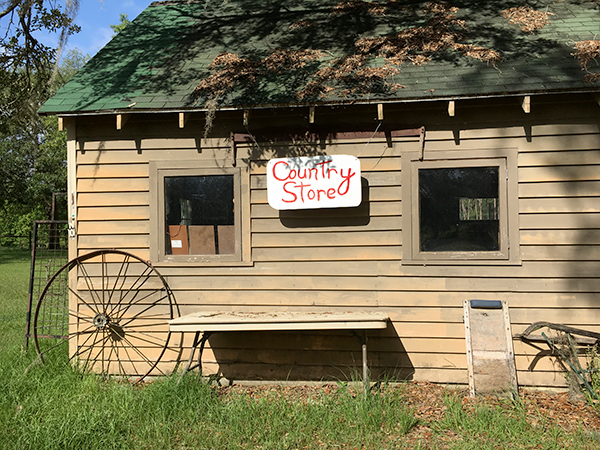 Big changes at our Country Store. 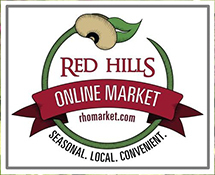 We are redecorating and adding more local, handmade items. We’re going to have a pumpkin patch this year. 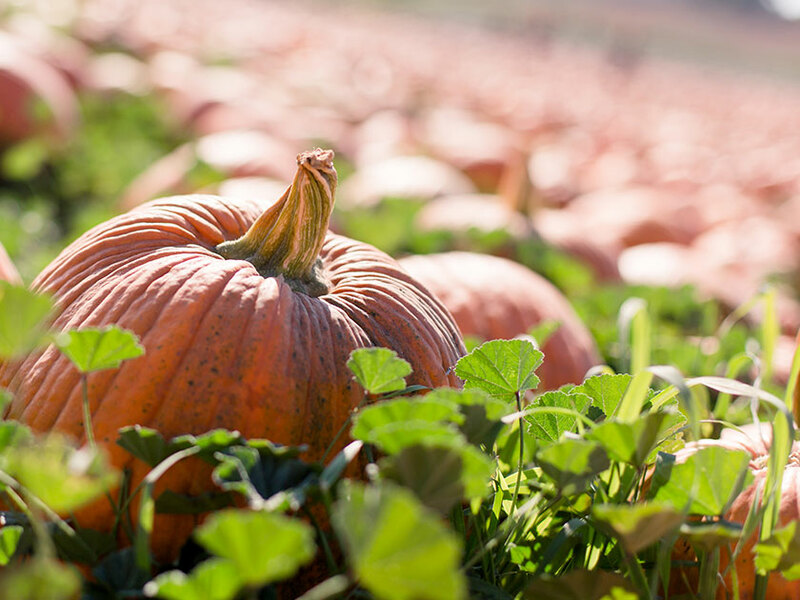 In the midst of our Seminole Pumpkins – an edible squash which we’ll also be selling – we’re offering a variety of the traditional bright orange pumpkins. 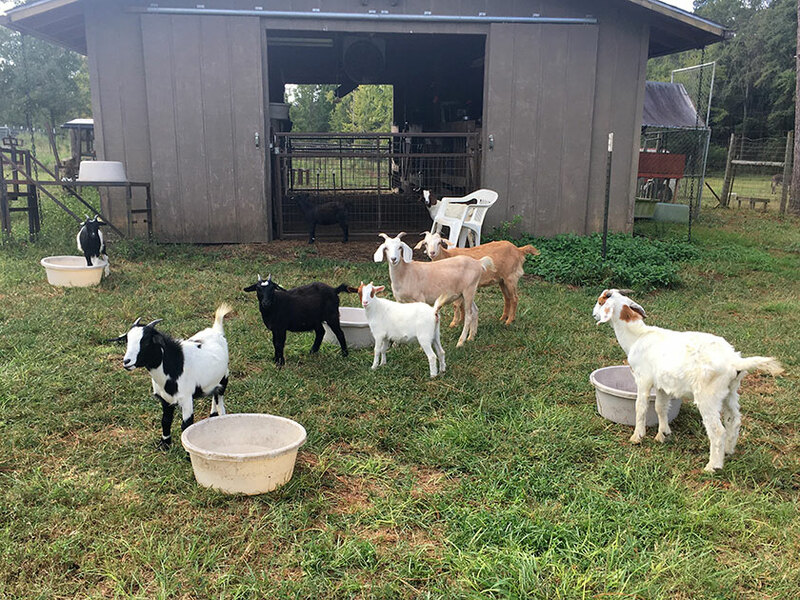 We have goats for sale as pets or registered breeding stock. Spanish/Kiko/Myotonic blends and registered Mini-Myotonic Goats. We’ve been raising Guinea Fowl keets just for the Farm Tour. This year we have the classic domestic gray pearled variety. Like the middle one in the photo below. 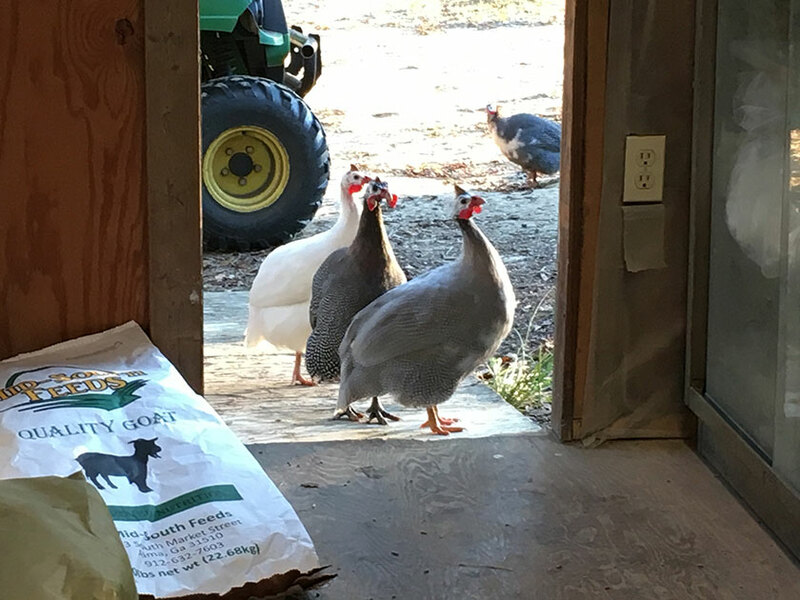 The group in this photo is not shy about wanting more corn tossed out to them from the feed room. Once established, Guineas need no care from you. They range the property eating bugs and roosting in the trees at night. You’ll need a caged-in area to start them out. Feed and water them there for 2-4 weeks and they’ll know where ‘home’ is. Our established flock expect a scoopful of corn kernals every morning as we go out to feed livestock. It is a myth that Mayhaw Berry trees have to grow in water. They’ve always been found in wetlands because they can’t tolerate fire, and fire is a natural occurrence in Florida forests. 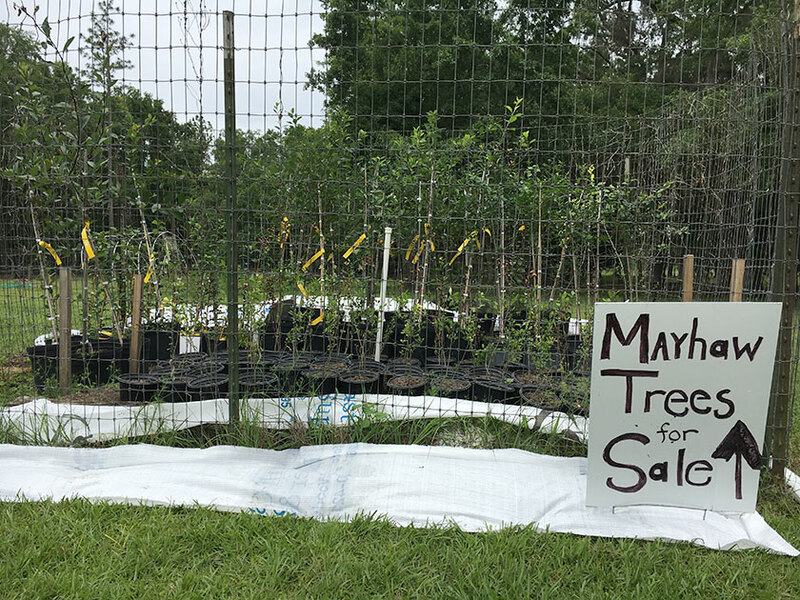 More information about our trees on the Mayhaw Berry Tree page. They actually make great landscape plants since they don’t grow more than about 40 feet, do not have invasive trunk or root system and are a pretty shape. You don’t need more than one for pollination, but you can expect a better harvest if there’s more than one. We’ll have persimmon trees for sale, as well. 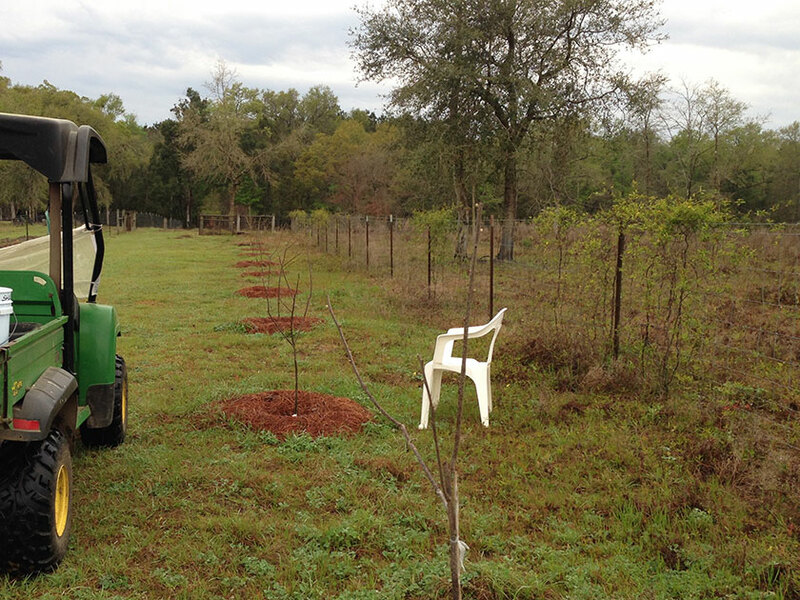 We are growing persimmons as a cash crop in our newly planted orchard, which you will see if you go on a hayride. We cut the fruit off early this year, though, so they could focus on growing some more. There are two types of edible persimmons. One is edible right off the tree and the other, called ‘astringent,’ is for cooking. Persimmons are eaten fresh, dried, raw, or cooked. It’s the Asian population who really knows what to do with Persimmons. But you can Google some recipes, of course. We’ve made Persimmon Bread, which tasted great! From Wikipedia, “The trees of all species have stiff, tumescent leaves, but the female can look less turgid than the male because the leaves droop when fruiting, perhaps because of the heavier nutrient requirements. They grow swiftly, and are resilient to the stresses of unpredictable climates. Persimmons can tolerate and adapt to a wide range of climates. “Persimmons are also known for their resistance to diseases and pests. They are one of the last trees to leaf out in the spring, and do not flower until well after the leaves have formed, bypassing the threat of blossom loss to frosts. The fruit hangs on the branches long into the winter. Because they grow swiftly and colonize off their root systems, they are ideal for helping recover habitat. I’m not sure what varieties we’ll have yet. We’ll know more as the Farm Tour approaches. 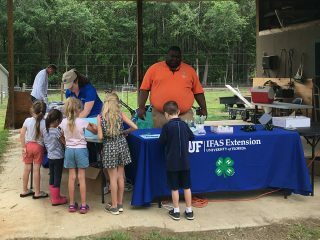 This year, the Jefferson County Extension will be bringing 4-H Enrollment information and hands-on Ag projects for the kids. As always, agents will be here to answer weed, seed, and bug questions. The Extension provides practical education you can trust, to help people, business, and communities, solve problems, develop skills, and build a better future. Checking to see if this group can join us. Check back soon! Kids can climb in a real fire engine, wear real fire gear and talk to fire men and women on Saturday and Sunday. 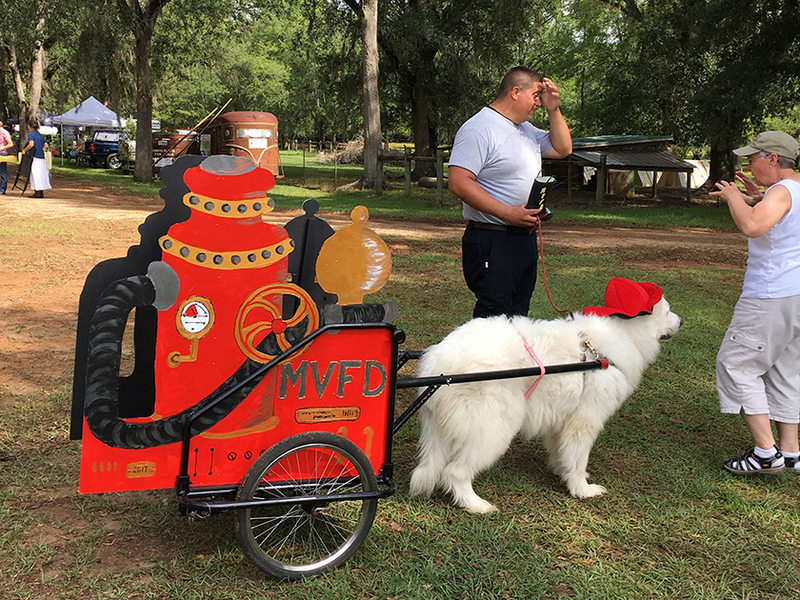 The Monticello Volunteer Fire Department come to all our festivals, along with their mascot, Thor, the wonder dog. Faye Prichett is the owner and caretaker of “Thor” Henry, the Great Pyrenees mascot of the Monticello Volunteer Fire Department. She is also the creator of a world of handmade jewelry, Pom Pom Pals, Mini Mates key chains and crocheted items. Livingston Productions propagates and grows all their own plants organically. 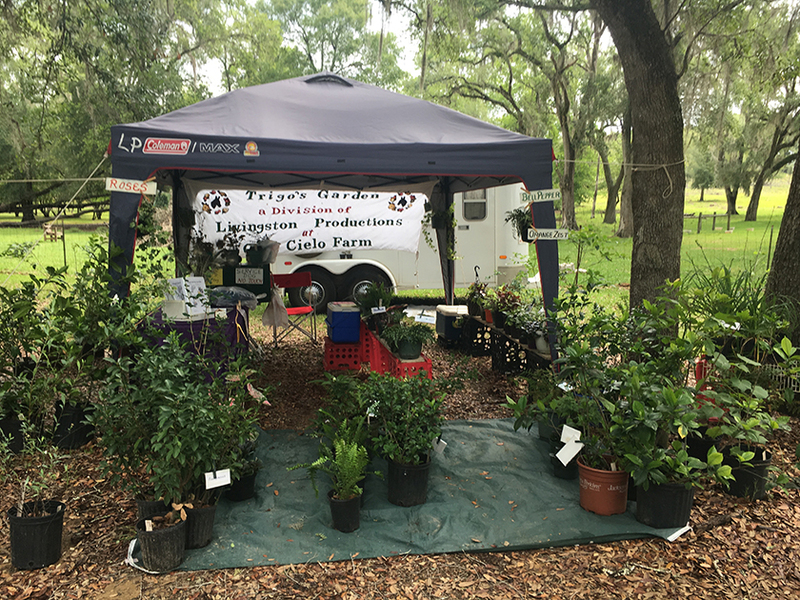 They carry native plants and provide customer assistance after the purchase. Livingston Productions is also known world-wide for their donkey blankets and other horse and canine related products. 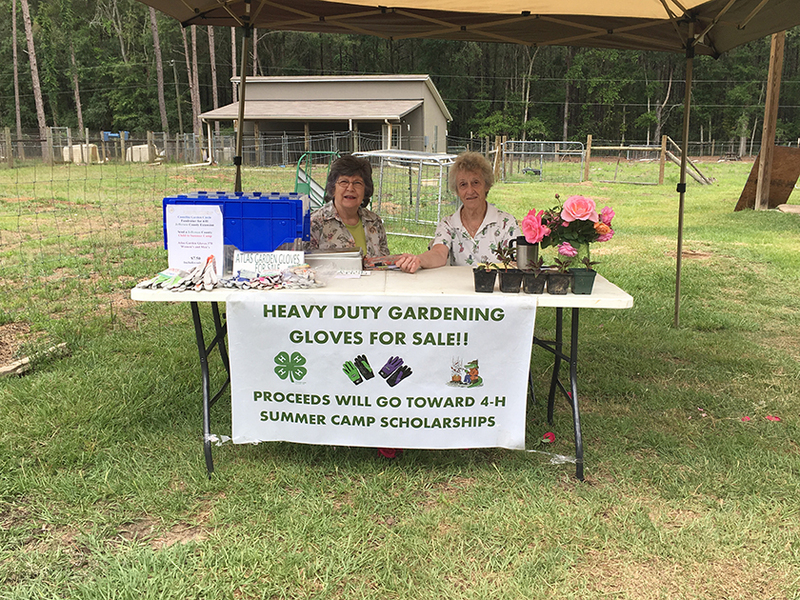 Marilyn has been one of our most popular vendors through both the Mayhaw Festival and the Fall Farm Tour for many years. Come join her under the tent to share knowledge and enjoyment of the beautiful plants and buy your plants for Spring. 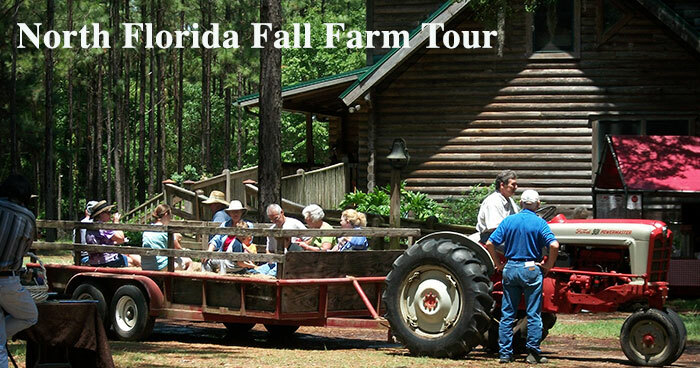 Agritourism is one of Jefferson County, Florida’s specialties and the Tourist Development is very supportive. Farm Credit of Northwest Florida is here to help rural America grow, and we have the resources and stability to meet all your lending needs. We are committed to working with you and others in agriculture to help grow a better community. FMB Bank helps to educate our community in a variety of ways. They go to schools, institutions and organizations to teach a range of different financial education topics—to groups of many different ages and backgrounds. They also host bank tours, where branch managers, along with their staff, welcome groups of elementary, middle, and high school students to tour their facilities. People learn what a bank is, what it does and why banks exist and offer the services and products they do. To get updates, sign up for our newsletter (in the sidebar), keep up with us on Facebook and Bookmark This Page to see all the fun and education we’re lining up. For a map and directions go to our Visit Us page. For places to stay, go to Jefferson County’s website.